Dear John: Trite and manipulative and loaded (I mean loaded) with clichés, this is yet another far-fetcher tear-jerker from the Sparks factory, directed by vanilla hack Lasse Hallström with his usual grace and subtlety (pffffft) and some distasteful 9/11 exploitation thrown in. 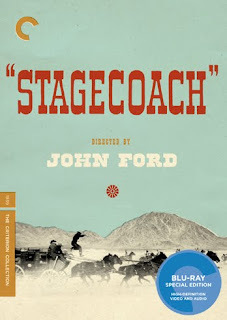 Stagecoach- Criterion Collection: Ford's 1939 classic is, for all intents and purposes, the archetypal western. Ford may have later explored the genre with greater sociological and psychological sophistication, and contemporaries like Hawks took the western to greater emotional and visceral heights, but it all started here. Everything that we think of when we think of the western came from Stagecoach, which distilled the genre conventions and made the damned thing respectable. Criterion's new special edition, available on both DVD and Blu, is loaded with the expected (but still impressive) array of top-notch bonus material. The Road: Director John Hillcoat creates a dark, powerful take on Cormac McCarthy’s acclaimed novel, full of strikingly dystopian imagery and ruthlessly unvarnished storytelling (“Two left… one for you, one for me”). The scenes of violence and suspense have a disturbing immediacy, while Joe Penhall’s screenplay adaptation nicely preserves McCarthy’s sparse but poetic dialogue. It’s a tough, difficult picture, but it packs a wallop. Dr. Horrible's Singalong Blog (Blu-ray): From the Internet to DVD and now to Blu-ray, Joss Whedon's side project, originally done as a self-financed goof during the 2007-2008 writers' strike, is one of his finest works to date-- in its brief running time, it packs as much emotion and fun as the best episodes of Buffy. DVD Savant gives the Blu-ray upgrade a thumbs-up as well.